Have you ever seen the movie Amadeus? It’s my favorite movie of all time. The following is a scene where the composer Antonio Salieri, looking at the impeccable first drafts of Mozart’s compositions, marvels at the perfection of the work. He recognizes the hand of God. I have to agree with Salieri that God was clearly involved in Mozart’s musical genius and used him to grant us amazing beauty in the form of his compositions. I could write a thesis on how God has provided mankind with many blessings of beauty and how those things point us back to Him. But this is a recipe post and right about now you are probably wondering what in the world this has to do with Paleo shortbread cookies! Well…..you see, I can relate to poor old Salieri. At one point in the movie he laments how, in his view, God has not granted him genius but has, instead, cursed him with the ability to recognize genius when he encounters it. This frustrates Salieri and causes him to hatch a plot against Mozart. While I am not hatching any plots against others who happen to be more artistically talented, I do find myself at times feeling a bit envious of their abilities. When I see works of great artists, or hear amazing music or read brilliant poetry I long for a similar talent. This is also true when it comes to crafts. I can appreciate the crafts of others but have never been blessed with the crafting gene. HOWEVER, today I feel as though I have finally overcome my deficit in a small way with the following paleo shortbread tea bag cookies! This recipe falls into the category of dessert/treat AND craft. (Look out, Martha Stewart!) It would work really well at a tea or a wedding or baby shower. 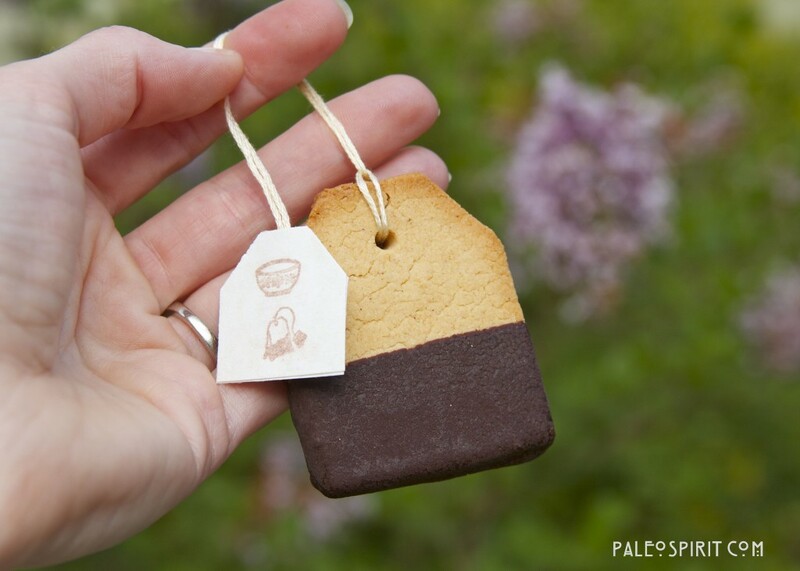 The paleo tea bag cookies could even be used as party favors. They are grain free, gluten free, nut free and sweetened only with maple syrup and a small amount of sugar in the dark chocolate coating. 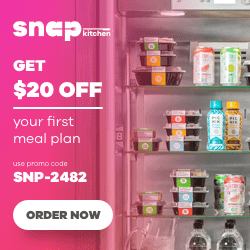 Place all ingredients in a food processor large bowl and combine using a fork and pulse several times to make sure everything is evenly distributed. 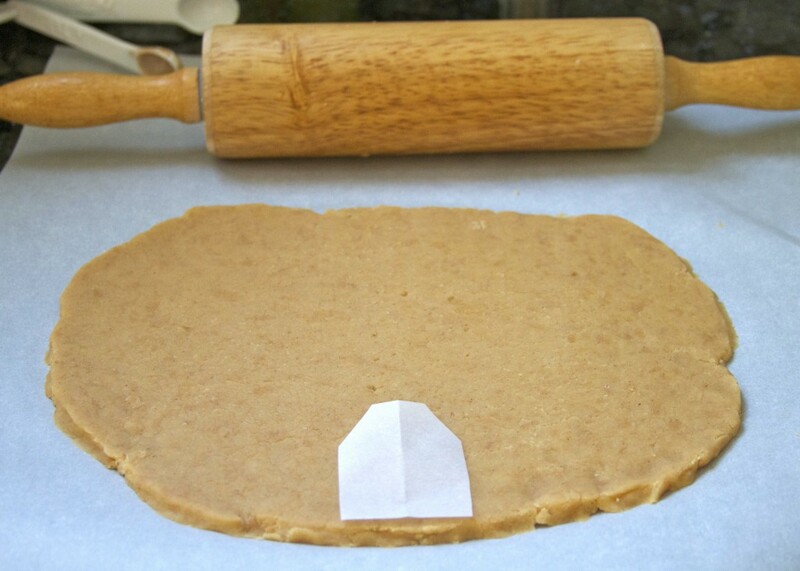 Turn out the “dough” onto a large piece of parchment or wax paper. It will be very crumbly. Press the dough together to make a solid piece. 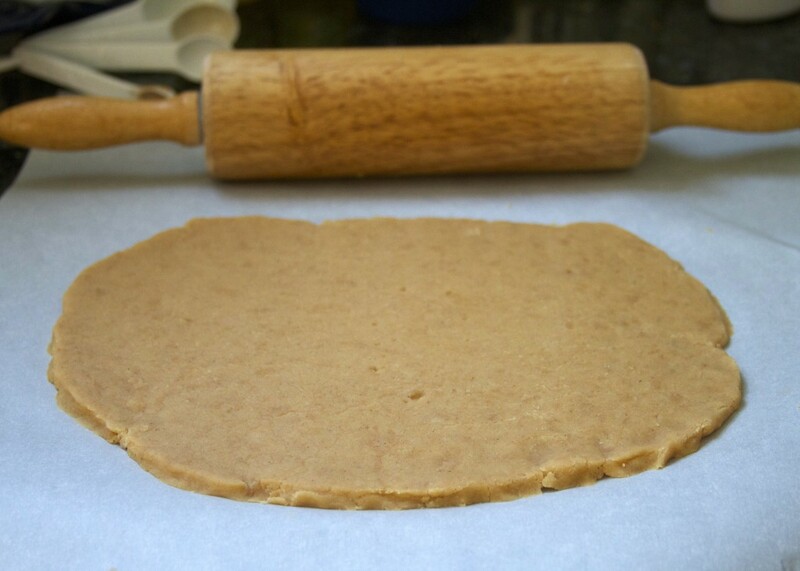 Use your hands and a rolling pin to roll out to a flat disk, approximately 8 inches by 10 inches and about 1/8 inch thick (maybe slightly thicker – see photos). 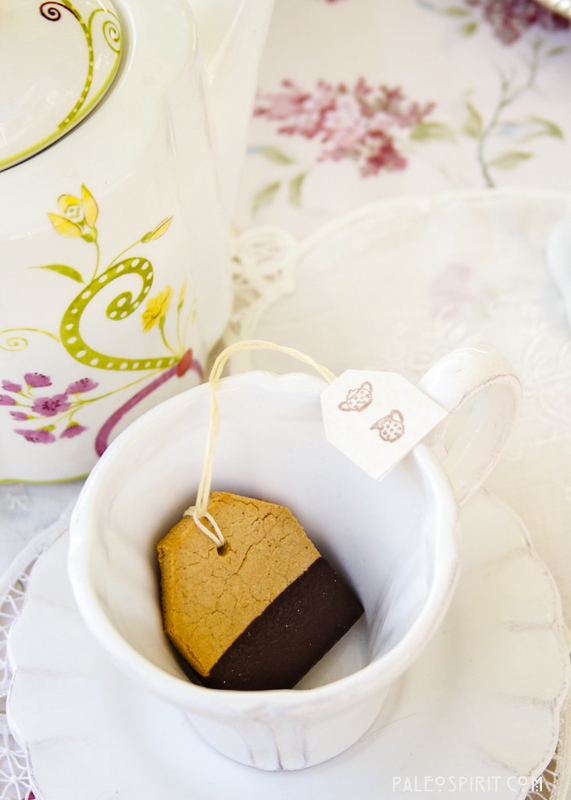 Cut out a piece of the parchment paper into the shape of a tea bag. Lay the tea bag template down onto the dough. Cut out the tea bag shapes using a knife. 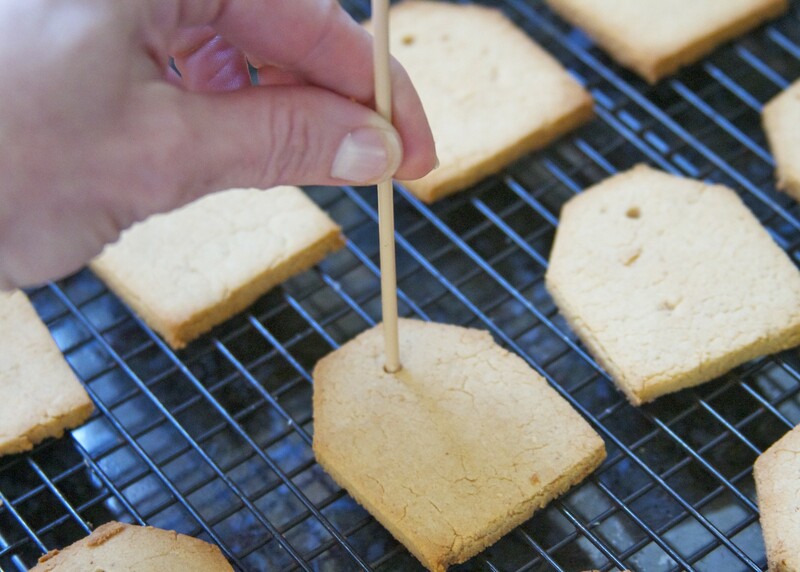 Once the shortbread cookies are on the baking sheet you can use one end of a wooden skewer (or similar) to make a hole in the top of the cookies. Once the shortbread cookies have cooled slightly you can move them to a wire rack. 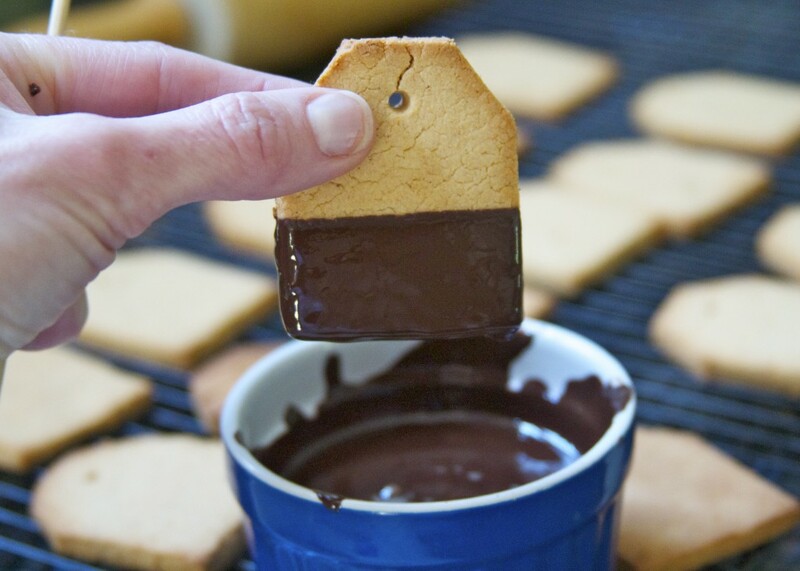 One by one, dip each completely cooled shortbread cookie into the ramekin with the melted chocolate. Allow any excess chocolate (is there such a thing?) to drip off. 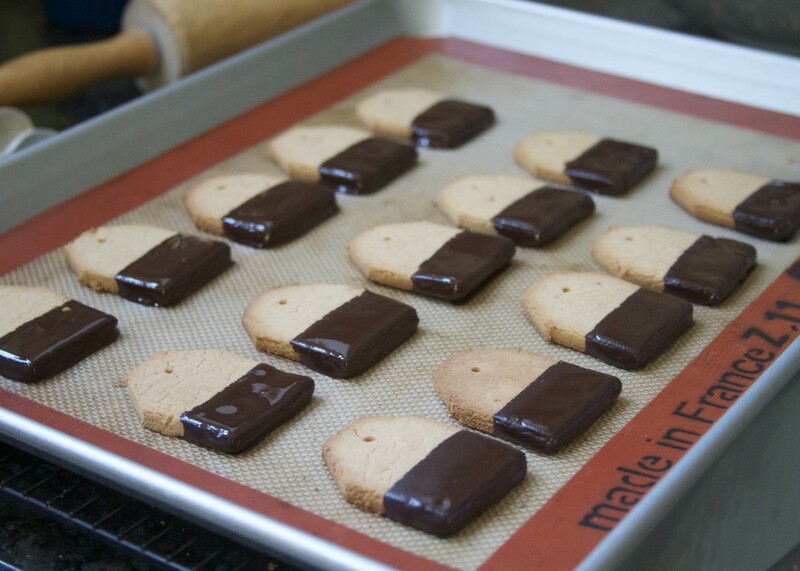 Place the chocolate coated cookies back on the lined cookie sheet and put it in the refrigerator or freezer for a few minutes to harden the chocolate. 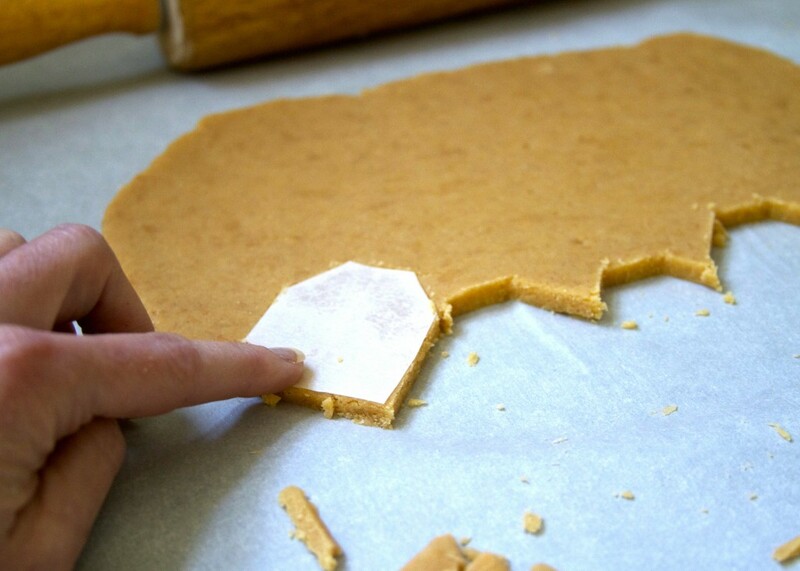 Cut one piece of 10-12 inch thread (we used embroidery thread) for each shortbread cookie. 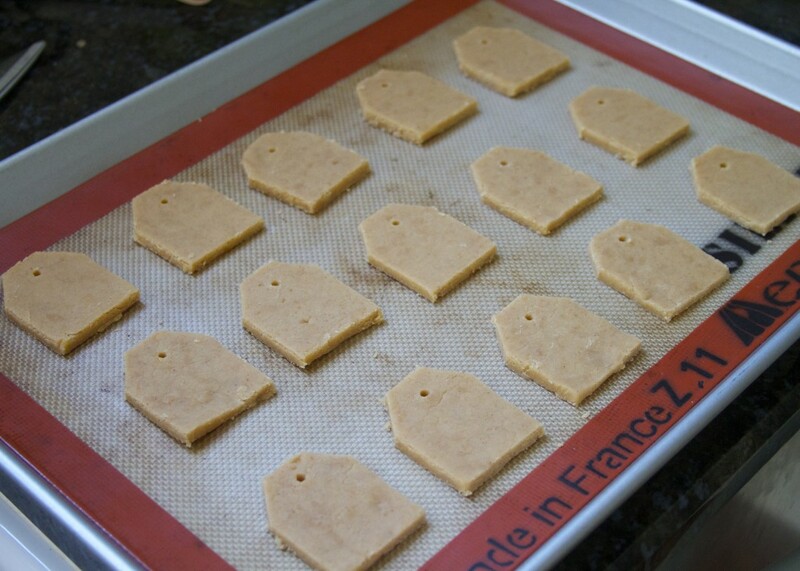 Double the length over and thread both loose ends through the hole in the top of the cookie. Take those two loose ends and thread through the loop end so that it looks like the photo below. Use a craft punch or scissors to cut out a custom shape in card stock. (I estimate ours was about 1 inch squared). Use a glue stick to cover the blank side of one of the card stock cutouts. Place the two loose ends of the thread onto the sticky paper. Cover the blank side of another cutout and seal both cutouts together, securing the two thread ends inside. 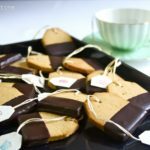 These paleo shortbread tea bag cookies are pretty sturdy. I had no trouble keeping them in tact while putting everything together. Of the 15 that I attempted to make, not one of them cracked apart. All of them ended up looking great. The cookies are not super sweet but I think they mimic real shortbread fairly well. The coconut flour tends to be very dry and the arrowroot can make recipes taste powdery. But the butter (ghee or coconut oil) and the moisture from the maple syrup seems to counteract that aspect nicely. I used 85% dark chocolate which made for more of a bitter chocolate taste. I actually think 70% dark chocolate would be ideal but it really depends on your taste. My boys and I love to have tea after school. Check out our favorite tea time snack – Chocolate Paleo Snack Cake. 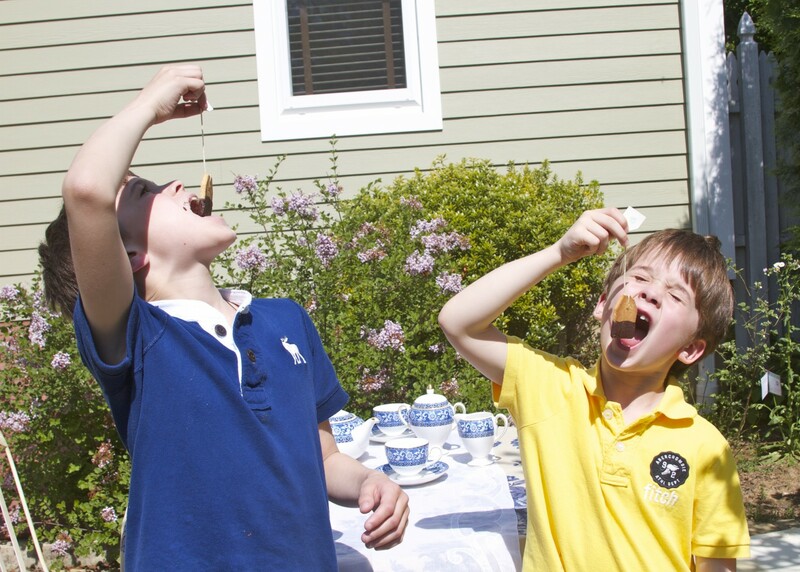 They were both pretty psyched to have some fancy cookies for tea time. If they were at a formal gathering I hope their manners would be slightly better than what occurred here today! Special thanks to my friend Pamela for all the help she gave me in putting together the tea bag cookie craft and for lending me some props for the photos. She is the one with the real crafting talent! 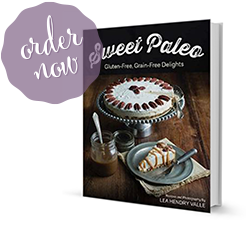 If you are looking for more paleo dessert recipes you might like Paleo Coconut Cream Pie or Primal Chocolate Cheesecake. 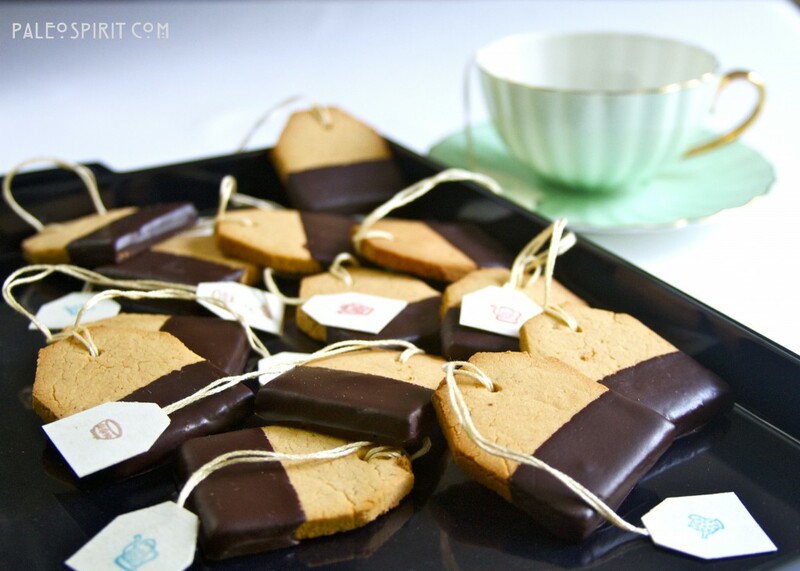 Tasty cookies in the shape of a teabag. Perfect for tea time! 56 Responses to "Paleo Shortbread Tea Bag Cookies"
Thank you, Shirley. I take that as quite a compliment coming from you. I love your website! And I hope to be there! It was a blast helping you turn these lovely cookies into “tea bags!” Lea, you constantly inspire me! Your photos are exquisite. Your heart is precious. I thank God to have you as my friend and my sister in Him. Thank you Pamela for the nice sentiments. It was fun putting these together with you! These are so fun! I might have to make a version of them for my Christmas cookie exchange party. The women would love them. That sounds like a great idea, Shannon. I’m glad you commented because I visited your blog and like what I saw. Thanks for stopping by! Thanks. They were really fun to make. Wow, these cookies are gorgeous, Lea, and look too good to be true (too good to be Paleo!). I can’t wait to give them a try. Thanks so much for sharing. I pinned a pic to my Pinterest page to share with others. OMG!!!! I am IN LOVE WITH THIS! I’ve just started having afternoon light tea with my almost 2 year old and have been wondering how to “paleo-ize” our facier teatimes (because the simpler ones are easy). It’s nice to get to sit with her and just talk, usually outside on the porch. 😀 😀 😀 I hope that I can scour your website for more teatime ideas!!! OMG I love this idea. So delicious looking and it can be a gift too. I liked Amadeus too and simply LOVE Mozart, along with the rest of the world, I’m sure. I love this recipe and in fact am in the midst of preparing my first batch, sadly the dough does not appear as shaggy as yours but very wet and greasy. Aalmost as if there is not enough flour. Is that normal? I used what is in your recipe 1/4 arrow root starch – 1/2 cup coconut flour? I did not sub anything. Well, who knows ?? but they are finished now and they are WONDERFUL! I guess I just got worried there for a moment. Thanks, I suspect I will be using this recipe quite often. Coconut flour is really finicky. If you take a peek at the comments on the Coconut Flour Paleo Pancakes recipe you will see a lively discussion about this phenomenon. It really depends on the moisture content of the flour. It is very, very dry and absorbent and a little goes a LONG way. So your brand might be slightly different from mine or you might store it differently, etc… and that can make a difference. I suggest just adding a little bit more at a time to get the right consistency. That’s one reason I tried to show up close photos of the dough so that people could see what mine looked like before it went into the oven. Thanks Lea, I added on before I saw your reply. I will peruse the Coconut Flour link for more info. Yikes, mine is a wet mess too. I am going to add more coconut flour and keep my fingers crossed! Hi Lea, thanks for the recipe. I love how simple it is. My “dough” turned out like a batter, more watery than a pancake batter. I ended up adding another 1/2c coconut flour and 1/4c arrowroot flour. I was really pleased with the results, really aromatic and the maple syrup was an excellent sweetener. I forgot to increase the cinnamon so that flavour isn’t very pronounced in my cookies. Thanks again! A friend of mine made my coconut flour pancakes recipe and the batter came out like cookie dough. Sounds like you had the exact opposite problem! It never ceases to amaze me the different results people have with that flour. I’m glad you liked it but I could see how with that much more flour it might need additional flavor. Although I sort of like the cookie to have a milder taste that is offset by the chocolate coating. Anyone making the cookies without the chocolate coating would probably need to add more cinnamon or something similar for some more flavor. Thanks for the feedback! I love your website! Me and mine have just started paleo, my son has been on a GFCF diet for a couple years with fantastic success, but I noticed that with all the added rice and corn I was getting sicker, so 2 months ago we decided to go grain free. So far I find that it’s cheaper (!) and easier, and my tummy likes it better, too! 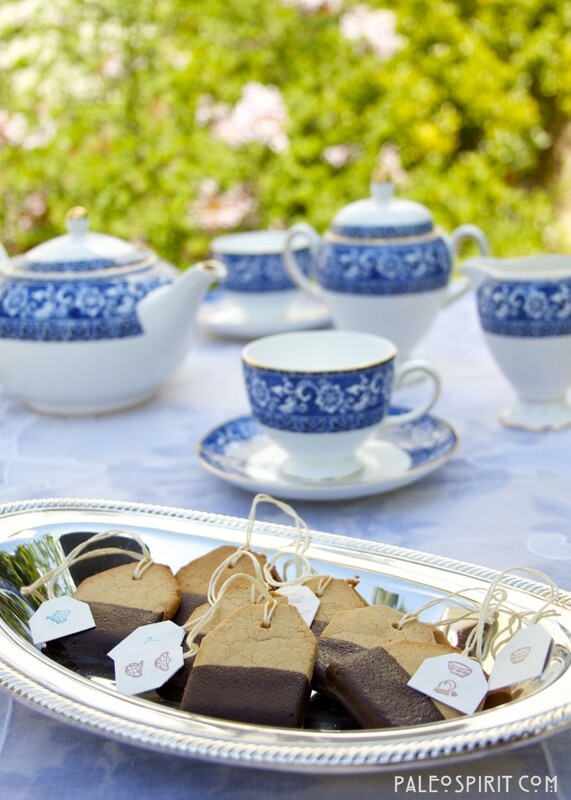 I have been searching for recipes for a tea party wedding and that’s how I found you! Thank you!!! Don’t you just love Google? 🙂 So glad you found me here. Eating rice and corn makes me feel sick too. Good luck with the transition to paleo. New to paleo diet. Desperate for help with my diabetes. 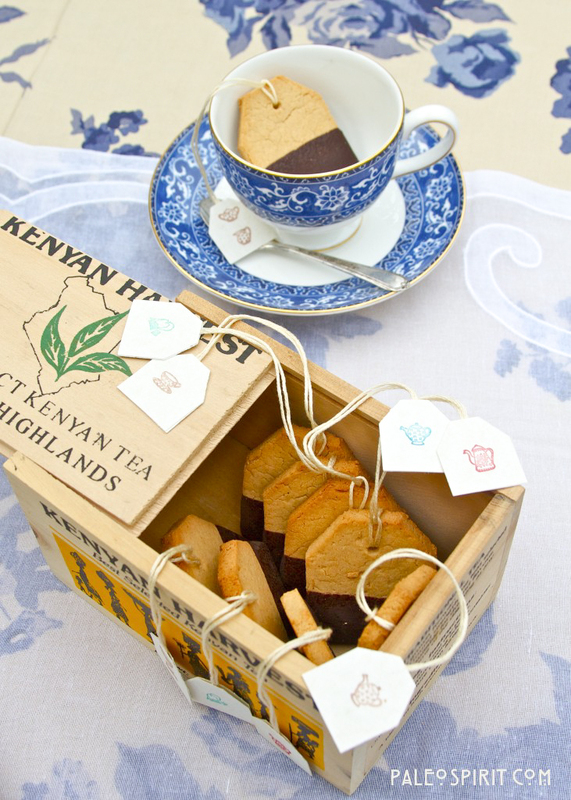 Your tea bag cookies are brilliant! I love your blog so far…just beautiful photos, and thoughtful posts. Glad I found you. I cant wait to try these!! They are so cute. I am going to start the paleo diet real soon. It is so nice to know I can still eat an occasional cookie!! Thank you for this recipe!! Ámadeus is one of my favorite movies too, Lea!!! As a Scottish paleo convert these get the thumbs up from me. It’s New Year’s Eve as I write (more imprtant than Christmas in the eyes of a true-blue Scot) and I am going to make them for our BBQ here in OZ tonight. Thanks! They look gorgeous! Thank you Maria. BTW my heritage is Scottish (Hendry of the MacNaughton Clan). Happy New Year! Haha! I KNEW we had something in common! 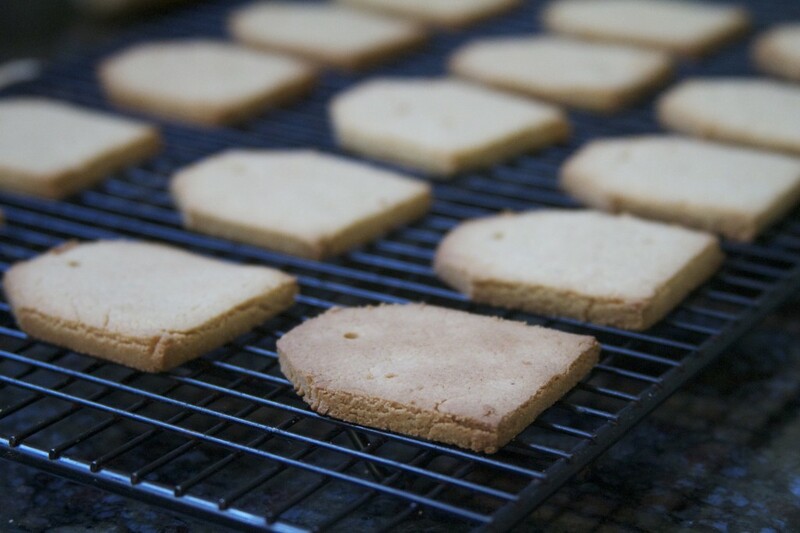 Paleo aside, I syill love my mum’s shortbread recipe. I allow our family to have it at new year. Happy New Year to you too. Should have replied on Hogmany! These look lovely! Are they crunchy? Thanks Heba, These cookies are crunchy after they are cooked. They tend to get softer depending on how you store them. 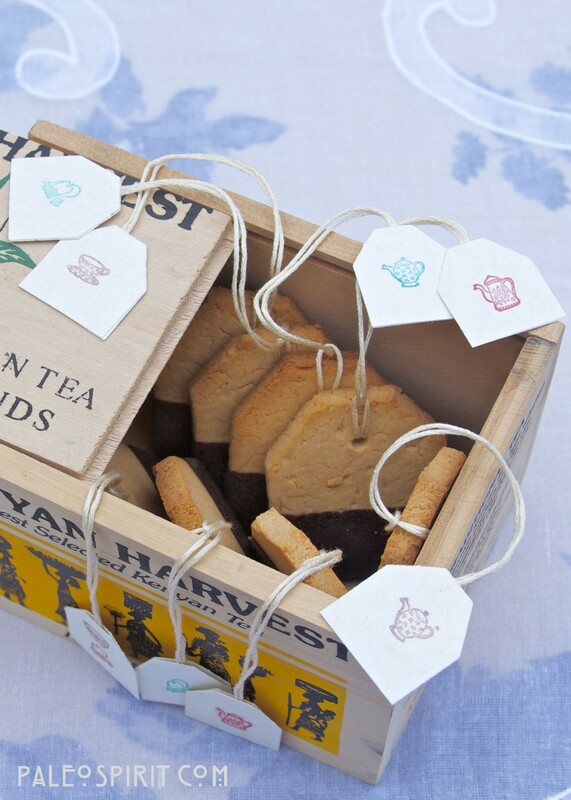 Love the tea bag idea! I made them as basic shortbread cookies and the batter turned out quite doughy, so I added some more coconut flour and arrowroot until it went drier. They were still delicious! I’ve popped them in the freezer, do you think they will stay the same crunchy consistency? And for next time, would it be better to leave them in the cupboard for two weeks? I found that they got softer over days not crunchier. Not sure what would happen if they were stored in the freezer. Hi, Thanks for posting such a yummy and adorable recipe. Like many of the posters above, mine ended up a globby mess and I needed to add more flour. Would you mind sharing which kind of coconut flour you used (maybe grams weight if possible) and which fat you used? I am expecting that most who had a globby mess like me used melted coconut oil. I am considering not melting it next time, but wonder if you used butter instead. Thanks again, mIne ended up fine, but they were a little dry. I would love to improve it! When I made the cookies I used melted coconut oil. I’ve also used melted butter. In trying to help someone else out I suggested trying the fat cold. I still think that’s a possibility if you are having trouble. But, honestly, because this recipe uses coconut flour that is more likely the issue. Coconut flour varies so much by brand and by how it is stored that it is often tough to get consistent results. The quantity that works for me on a consistent basis may not work for someone else. If I were making them again I would start out with cold fat mixing with the ingredients in a food processor. For someone who has already started the recipe and finds it too oily I would recommend adding a bit more flour until you get the right consistency. I hope it works out for you! Hey Lea, is these cookies look so cute!! But I think I’ll cut them into heart shaped cookies since V-day’s coming! One question though – is it possible for me to use tapìaoca flour instead of arrowroot flour? I don’t know where I can find arrowroot flour in Buenos Aires! And how much tapioca flour should i substitute the arrowroot flour for? thanks!! Heart shapes would be great with these. I think I’ll do the same since I just bought a heart cookie cutter a few days ago. You can substitute tapioca one for one with arrowroot in my experience. Good luck. Hmm. I actually do not recall the exact type of dark chocolate I used in this recipe. Quite likely it was a brand from a store called Trader Joe’s that is 85% dark chocolate. But most any dark chocolate (at least 70%) would be good. Would love to try this recipe but I can’t eat coconut. I might be allergic. What could I use instead? Unfortunately, coconut flour is very particular so there’s no easy substitute. 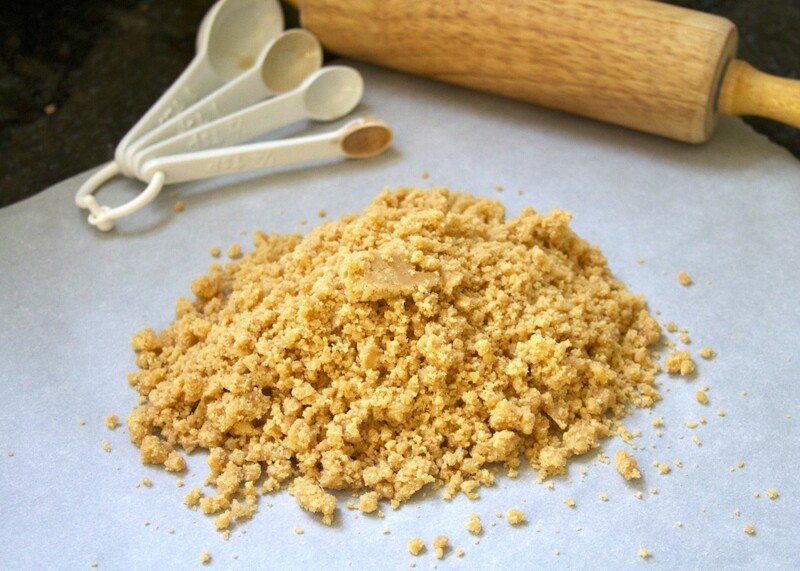 You could probably search on a paleo shortbread recipe that uses a different type of flour. It would have a very different ratio of other ingredients because of how dry coconut flour is. Just as an aside, coconuts are considered a tree nut by some groups but it is technically a droop (or type of seed). So my sons, both of whom are allergic to tree nuts, can eat coconut. Not sure if that’s your concern or not but thought I would mention it. Thanks for your comment.